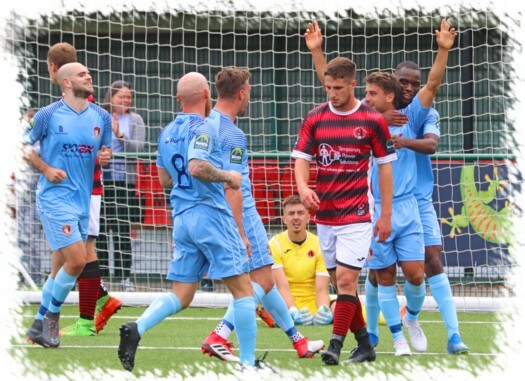 Hayes & Yeading rounded off a first class bank holiday weekend by following up Saturday’s 7-0 FA Cup win at Brimscombe & Thrupp with a 6-2 victory at Bedfont Sports in the Bostik League with Lee Barney finding the net no fewer than eight times over the two games. On the very impressive 3G surface at the Recreation Ground, United almost got off to the perfect start when after 30 seconds of play, skipper Scott Donnelly sent Toby Little away on the left, his well struck cross taking the slightest of deflections off a defender which was enough to take the ball away from the arriving Hassan Jalloh. 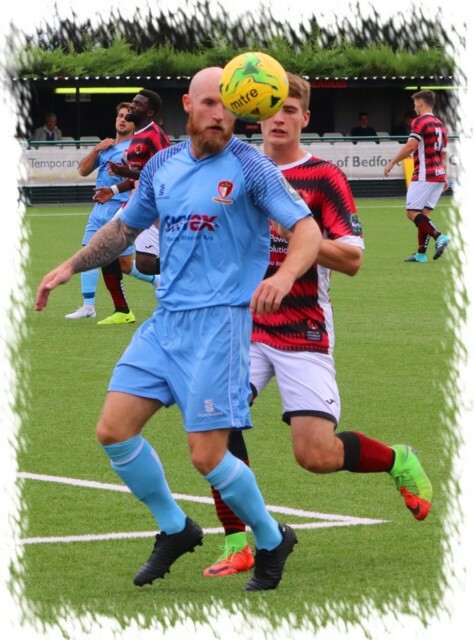 An opening for the home side was not long in coming either as a swinging centre from the right from Tom Pitt found former United man Jack Mills in the middle, his header thankfully going just the wrong side of James Shaw’s upright. Two minutes later though the deadlock was broken, by United as Little stepped up and planted a 25 yard free-kick into the top corner of the Sports net giving former United ‘keeper Rourke Pickford no chance. Having gone behind, the home side started to push forwards looking for a quick reply. Charlie Postance played a nice ball through into the run of James Simmonds but Shaw was down quickly to grab the ball at his feet and then on 17 minutes the home side really should have equalised. A high punt upfield was somewhat misjudged by Shaw who tried to head the ball but it went vertical and following a scramble the ball fell to Postance who with the goal pretty much gaping managed to find Ed Asafu-Adjaye on the line and the United man made an excellent goal-line clearance to maintain his sides’ slender advantage. Postance also got his head to the resultant corner but was far too high to trouble Shaw. Just past the half hour mark United really started to assert themselves on the game and two goals came in quick succession. After Jalloh and Tom Jelley had combined down the right, Lee Barney glanced a header wide of the target before the striker doubled United’s lead with a tap in after Little had found Jalloh on the left and the United man drew defender and ‘keeper to him before rolling the ball across for Barney to finish. Three minutes later Barney’s strike partner Lewis Toomey grabbed one of his own as a poor pass at the back gifted the ball to the United striker who strolled around the unprotected Pickford to tap the third home. 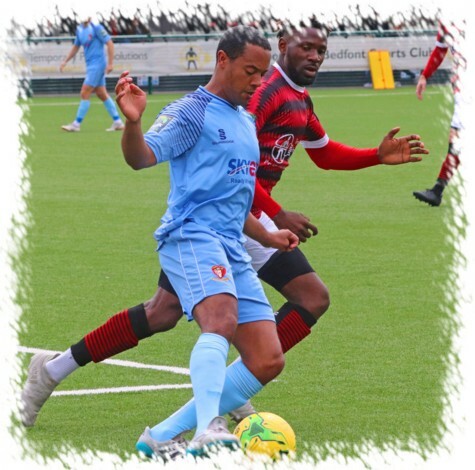 The home side did reduce the deficit four minutes from the break however as a free-kick was fired upfield, the ball dropped to Simo Mbonkwi on the edge of the box and his neat shot on the turn beat Shaw low into the corner of the United net. The second half was somewhat slow to get going with the only opening in the first fifteen minutes seeing a Mills free-kick for the Sports deflect off the United wall and fly just wide of the post, the free-kick being earned when Postance was fouled just outside the box by Shaw and while the home support and bench ere screaming for a red card, referee Smith seemingly acknowledged that with Roddy Collins in close attendanceShaw was not the last man and showed a yellow card to the stopper. Number four for United arrived in the 64th minute, again courtesy of Barney, this time a diving header from a Little cross going back across the dive of Pickford into the corner of the Sports goal. Postance for the home side saw a header loop just over the United goal with Shaw back peddling but minutes later Barney had his second hat-trick of the long weekend. Jalloh played the ball up to Donnelly, he slipped it inside to Little who hit a low shot from the edge of the box that appeared to be comfortable for Pickford only for the stopper to fumble the ball against the post leaving Barney the easiest task of tapping home United’s fifth. Two minutes later Postance had the ball in the United net from a Mills centre only to be flagged offside only for United to score a sixth minutes later when the impressive Jalloh attempted to go around Mills in the box, the Sports man getting away with a shirt pull before adding a trip to the foul which sent Jalloh to the ground and gave referee Smith little option but to point to the spot. Donnelly stepped up and confidently sent Pickford the wrong way. Although well beaten, credit the home side for continuing to push forwards, substitute Jason Nwachukwu met a Mills cross but his flicked header was just off target and then a minute from time he collected the ball on the edge of the United box and found Postance who curled a fine shot beyond Shaw into the top corner the reduce the arrears. Shaw was required once more as the game entered stoppage time, producing a routine diving save to deny Alex Rose and it was United who took maximum points at the final whistle making it 13-2 over the two weekend matches.